Herrell et al. described the use of a cooling sheath for achieving surface renal hypothermia during laparoscopic surgery. This consisted of a plastic double jacket with inlet and outlet tubings. In a porcine model, 12 animals were divided into three groups. In group I, the kidney was mobilized by open surgery and surface cooling achieved with ice slush after arterial occlusion. In group II, the kidney was mobilized laparoscopically and the renal hilum was clamped for 60 minutes without any hypothermia. In group III, the kidney was mobilized laparoscopically. In three of the four animals in this group, a 4 cm open incision was made to apply the cooling jacket around the kidney. 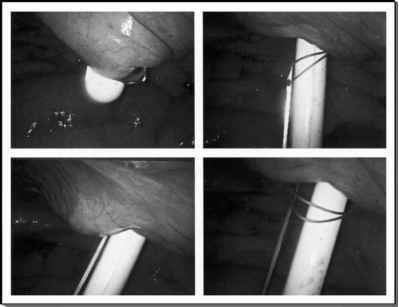 In the last animal the jacket was placed around the kidney through an 18 mm trocar. Mannitol was given intravenously and the renal artery clamped using a bulldog clamp. A tubing pump was then used to initiate flow of cold sterile saline from a chilled bath (3-5°C) through sterile tubing into the sheath. Outflow to the bath through similar sterile tubing created a sterile circuit. Renal and body temperatures were recorded. After 60 minutes, the clamp and the sheath were removed. The kidney was harvested at seven days after ischemia. The renal temperature in groups I and II dropped to the optimal hypothermic range (5-25°C) within five minutes. Overall surface ice slush cooling resulted in lower temperatures than the sheath, but this was not statistically significant. In one animal, leakage from the sheath, with continued irrigation led to transient drop of body temperature to 34°C with no adverse events. Histology revealed no differences in kidneys from groups I and III (hypothermia) whereas kidneys from group II (no hypothermia) showed expected tubular epithelial necrosis and vacuolization.